If you don’t read my other blog that’s listed to your left there, then you don’t know that Monday night the thieves from last week returned and took everything. And I mean, EVERYTHING. All the computers are gone, all of our beautiful new cameras are gone, all of it is gone. They hit two rooms in addition to ours, and they only targeted the Apple computers. I’m numb and heartbroken. My kids are angry and heartbroken, and I feel like the Little Dutch Boy, trying to stop a flood of emotion, inactivity, and whatnot with my bare hands. I’m so, so, so drained. Today I stayed at school late with some yearbook kids so Stueve could be a dad. I didn’t mind–I attended to some paperwork and then helped with the yearbook a little. And my mom texted me that she had made my favorite chicken, so I stopped by and picked up some dinner. When I got to my place, I thought, just for a second, how nice it would be to open my door and collapse into someone’s arms and be told that I could just be a little weak for a few minutes. 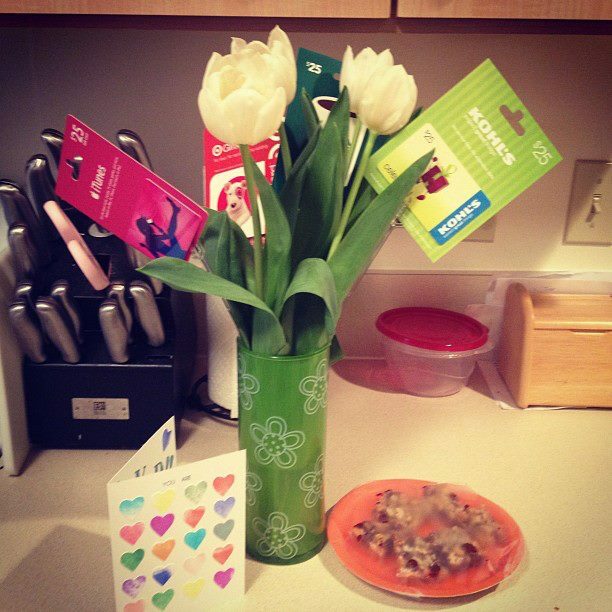 My favorite cookies, my favorite flowers, and gift cards from my favorite stores. From my family. All of them pitched in to give me a little something to make my day a little less sucky. Totally unnecessary for them to do, but I really really loved the surprise. I needed it. Yeah, there are sometimes when I’d really like a man in my life. But who needs a man when you have a family? Next Post → Student Artwork. Thanks for letting us spoil you. You are more amazing than anyone on this earth realizes.